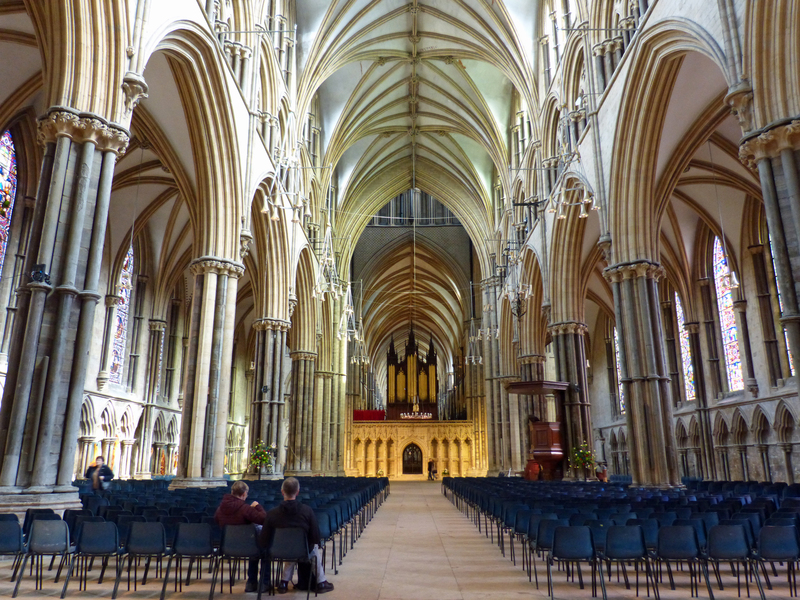 Lincoln Cathedral is one of the greatest buildings in the world. 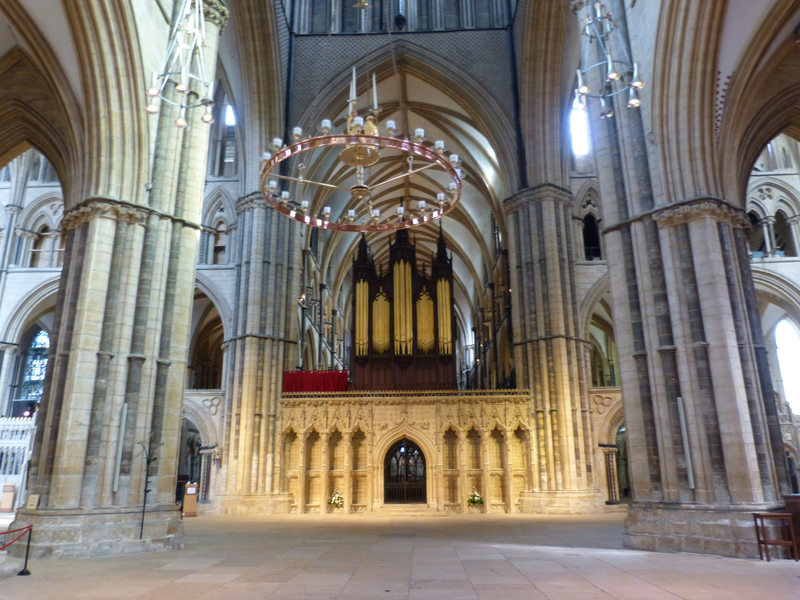 It’s not the oldest in England – Durham cathedral is, though Lincoln dates from 1072. 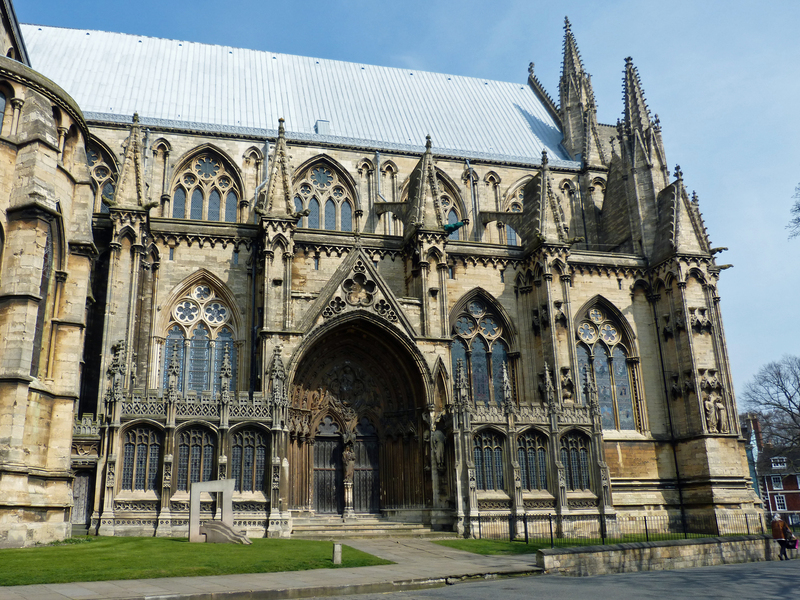 It’s not the longest – York cathedral is, though Lincoln is 548 feet in length*. It’s not filled with religious sculpture and great art – it’s a Protestant cathedral. It was the tallest building in the world at 525 feet in height until the enormous spire was knocked off the highest tower by a storm in the year 1400. The highest tower is 251 feet tall without the spire and can be seen from 30 miles away. When you see this magnificent building, walk its great length, look at the stonework and sculpture done by men in the 13th century with little more than tools made of iron and wooden scaffolding to lift them to great heights, it’s impossible not to be astonished by what the cathedral builders of the middle ages accomplished. 1072 On the order of William the Conqueror the first cathedral in this place was begun. 1092 The first cathedral was complete. 1141 The first cathedral was destroyed by fire. The second cathedral was begun. 1185 An earthquake destroyed that cathedral, leaving only the west front and towers intact. 1192 Work began on the building we see today. 1280 The large “angel choir” at the east end of the church was dedicated to St. Hugh; the Chapter House and Cloisters were built in the mid- to late-13th century. 1307-11 The tall central tower was raised to its present height. 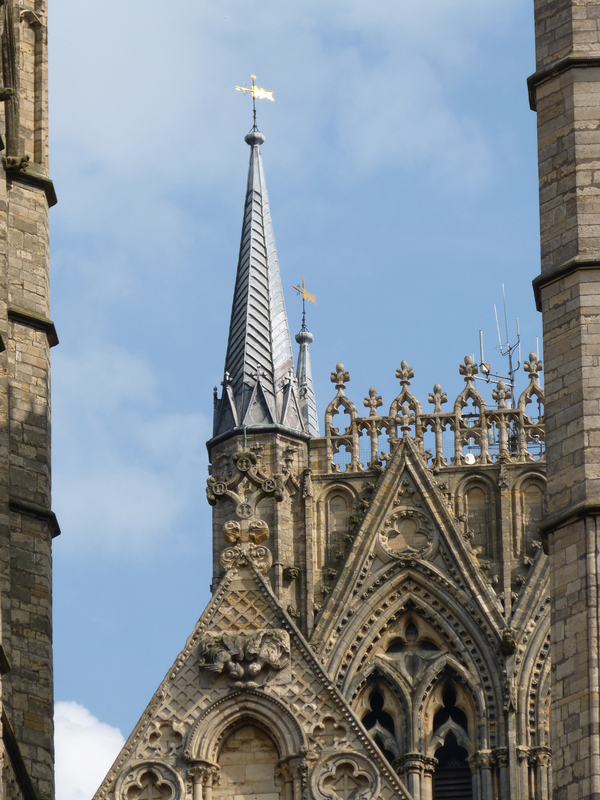 It’s steeple blew down in 1348; steeples were removed from the western towers in 1807. Here is a brief description of the cathedral with photographs. 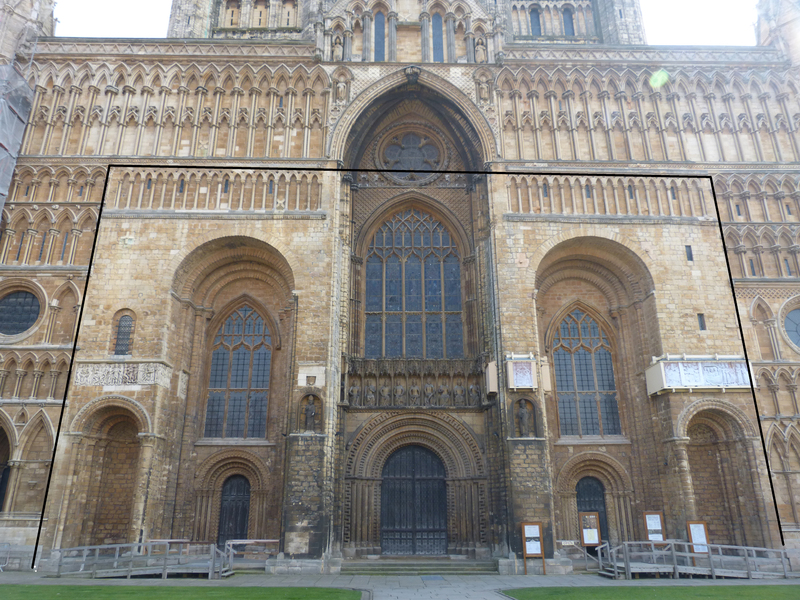 This picture shows the Norman (or Romanesque) west façade of the cathedral which dates from the years 1100 to 1150. I’ve put a black line around the part that is original. This is the massive Romanesque portal. The carving and the curved arch of the doorway are very typical of this period. Romanesque is the style used before gothic. The row of kings across the top are probably not as old as the doorway. This picture was taken from the rear of the nave. 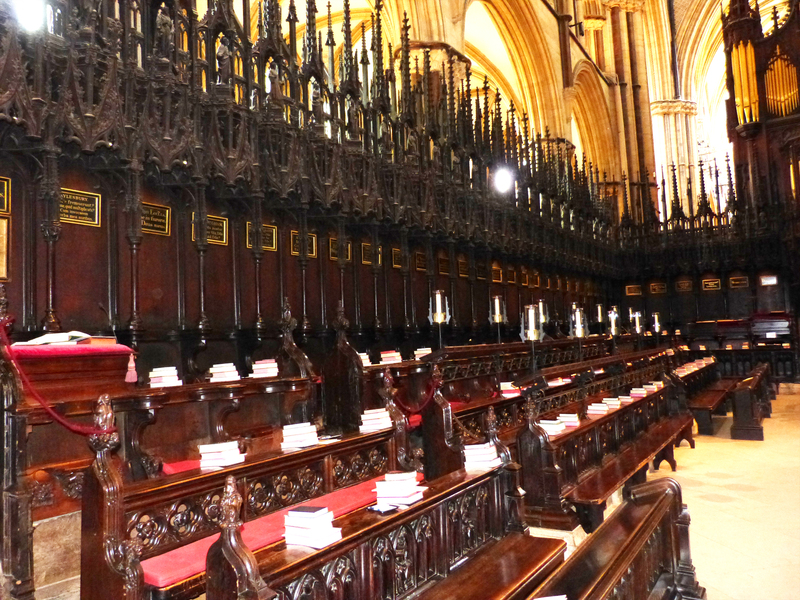 The golden stonework below the organ pipes is the central rood screen (the camera has yellowed the stone). 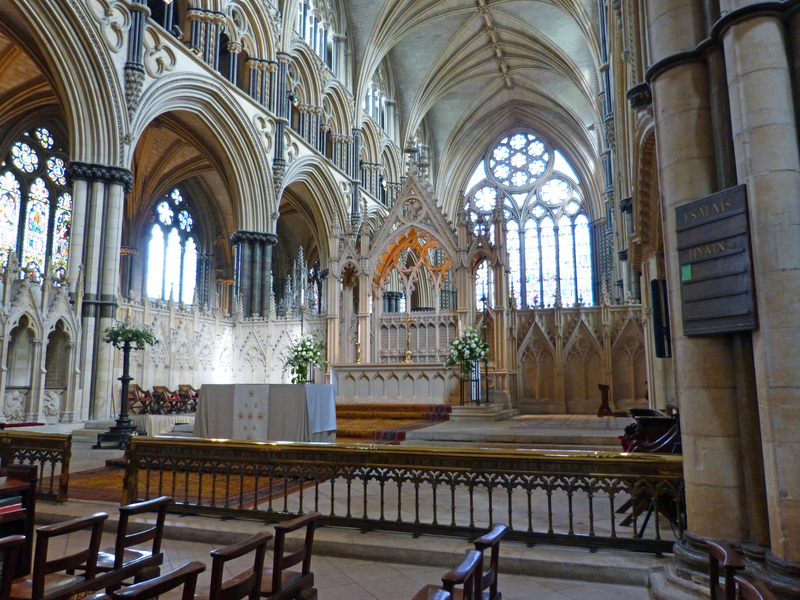 The nave is early gothic, the floor made of local limestone with thousands of fossils showing. On each side the lower walls are decorated with “blind arcades” – that don’t match. The term blind arcade means one with only wall behind it. Work stopped and started on this project as money became available resulting in many changes. 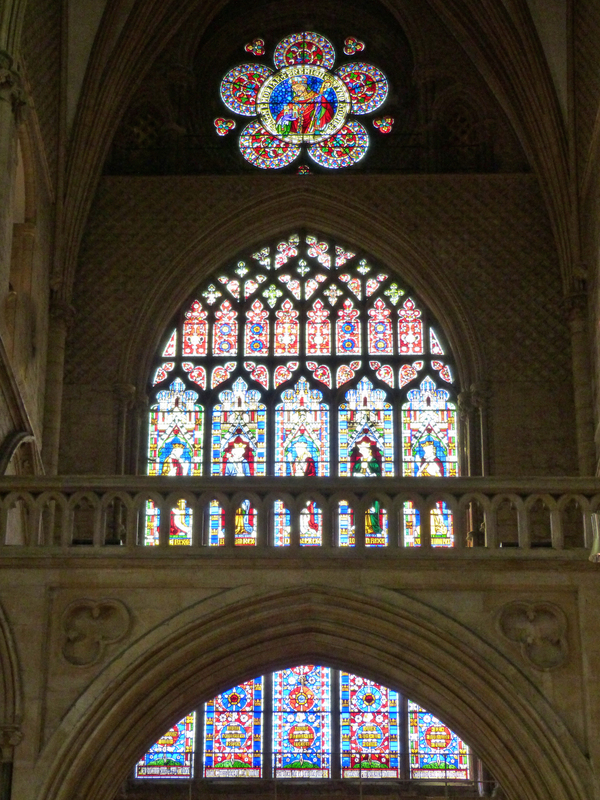 This is the large three-part window that graces the western entrance to the cathedral. This is a close-up of the top window. Sunlight playing on the left arcaded wall. This image shows the area below the great tower. Notice the enormity of the columns here – they once held the extant tower and the steeple that soared more than 500 feet in the air. You can see the rood screen in greater detail, but you can’t see here the many small heads of people and animals and other carvings that decorate it. 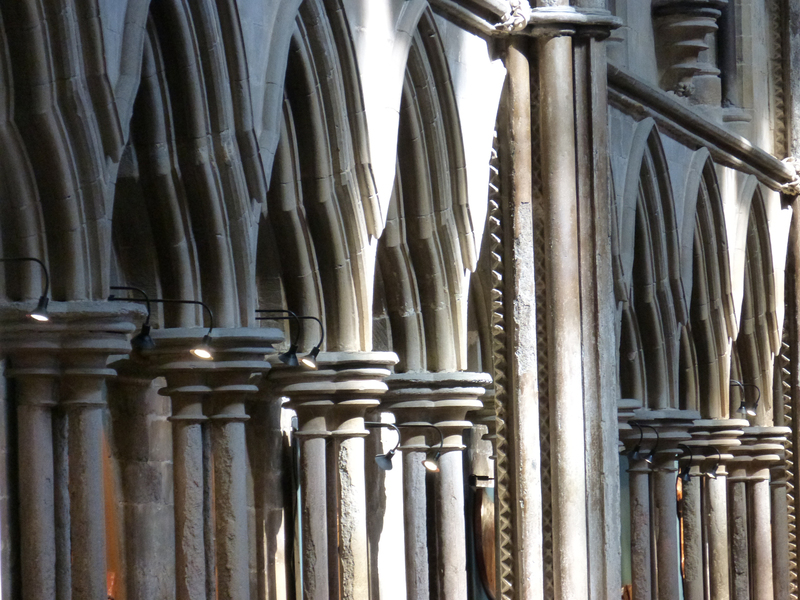 Other screens (unmatched) stretch across the entire width to the sides of the nave. No one who wasn’t a cleric was allowed beyond this point. Just east of the rood screen is the choir where the monks attached to this cathedral would pray several times every day. Typical of most medieval choirs, this one is made of very ornately carved oak. This particular choir has a personal connection for me. George and I sat in the second row of seats shown here on the 13th of September 2001 for a special prayer service for the victims of 9/11. 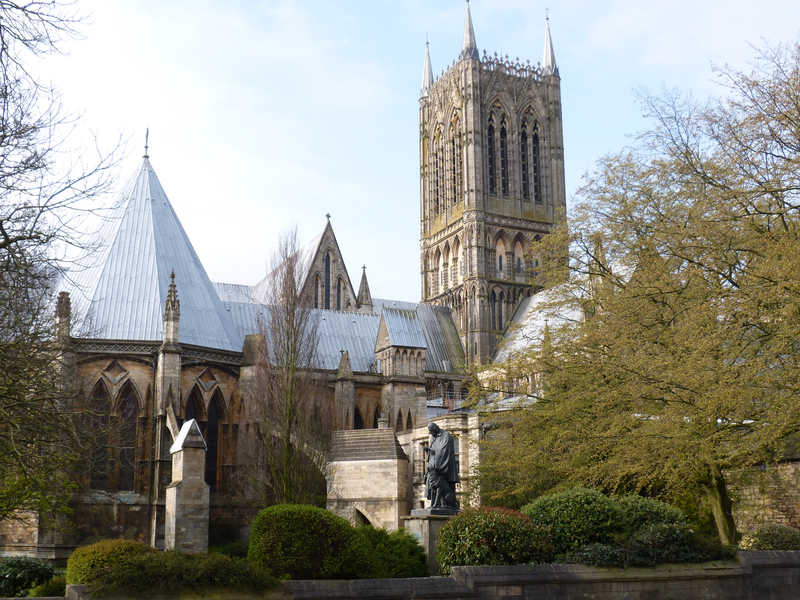 After the earthquake of 1185 destroyed the cathedral (leaving only the western wall which we still see today) a French monk was put in charge of the priory and the cathedral at Lincoln. His name was Hugo, which was Anglicized to Hugh. It was he who began work on the cathedral we visit today. The French by this time had developed gothic architecture for their great churches. It enabled the building of higher, lighter cathedrals with narrower columns supporting the weight. Buttresses were placed on the exterior help supported the weight of the walls and roof. Hugh was well loved and respected. He died in 1200 before the cathedral was completed and he was canonized (made a saint) in 1220. 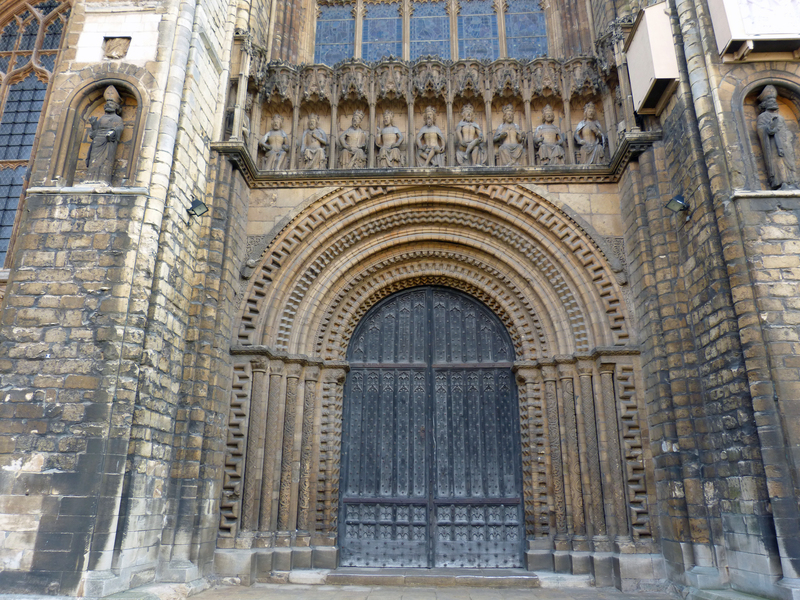 Pilgrims began arriving in Lincoln in large numbers to pray at the tomb of St. Hugh. Eventually this “angel choir” was added to the eastern end of the cathedral to honor him and to accommodate the crowds of pilgrims. This beautiful part of the building is later and finer in design, very light with large stained glass windows. This picture shows the Chapter House where the monks met often to conduct business affairs and to address non-religious concerns. It’s connected to the cathedral by renaissance cloisters. 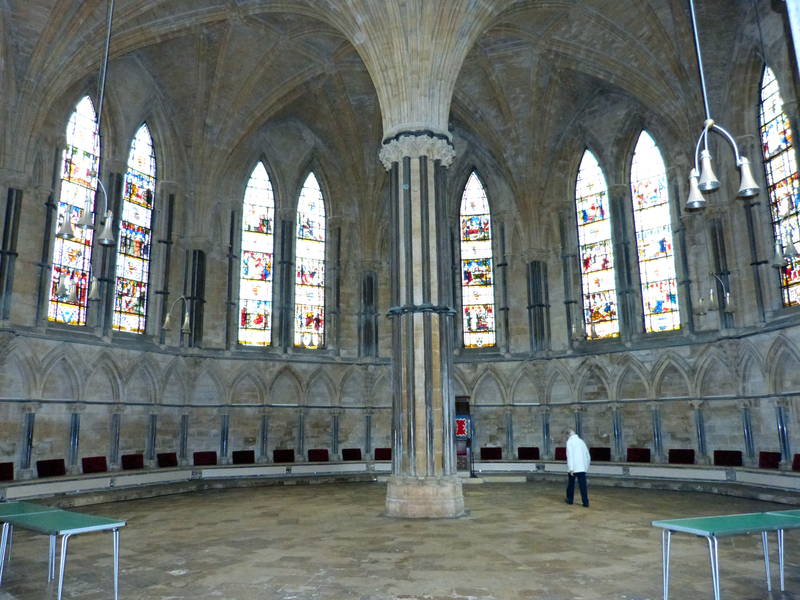 The Chapter House is a ten-sided building, of later construction than any other main part of the cathedral which is shown by the use of “flying buttresses” here and nowhere else. 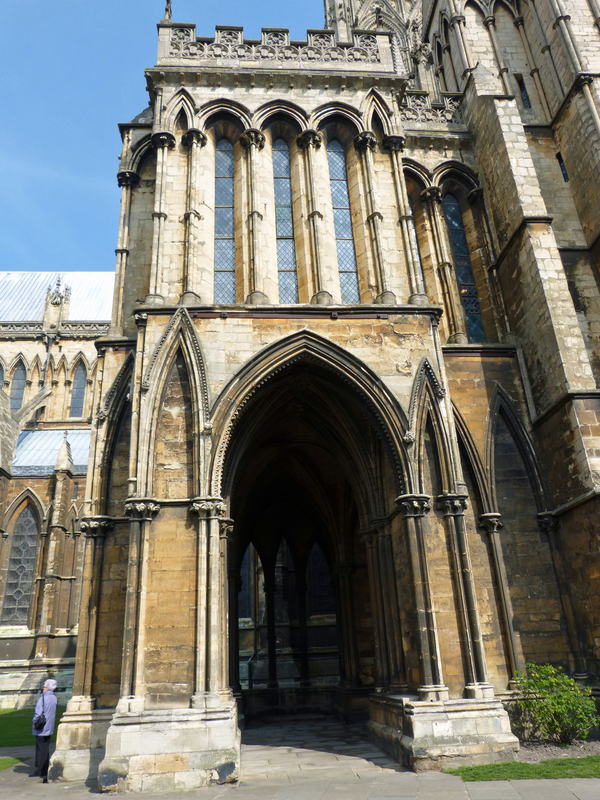 Here you see the Chapter House under the pointed roof; between that and the statue of Alfred Lord Tennyson, you can clearly see a short flying buttress while on the sides of the choir in the rear you can glimpse the attached buttresses used in this building. 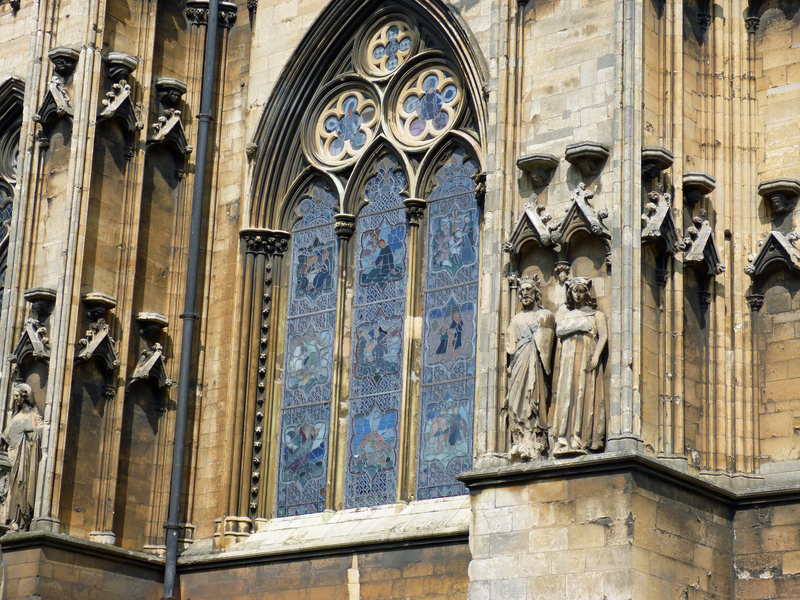 This is a photo of the exterior of St. Hugh’s “Angel Choir.” Again, as with the interior, you can see how much more decorative gothic architecture had become in eighty years. The sculpture on this part of the building is very fine. 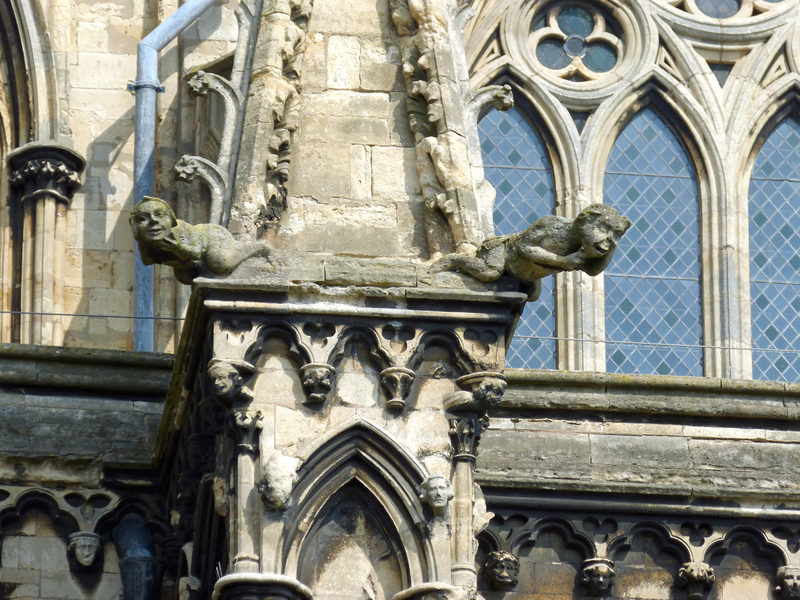 Gargoyles drain water from the roof. Remember, these figures and heads were carved from limestone in the 13th century with very primitive tools in large quantities. Take a moment to consider how difficult it was to work without many tools or even any math! This doorway is one of many places in this great old building where errors were made in measuring. Notice the difference in the arches on either side of the doorway. There were probably once many more statues fitted into the niches shown here. In all likelihood the images of saints and Biblical characters were removed and destroyed by the Protestants during the time of the English Civil War. Images of mere mortals survive. I particularly like the king and queen shown here. How did they do this? How was work this fine accomplished at the top of a structure this tall in a time when all they had to work with were iron tools, scaffolds and pullies? 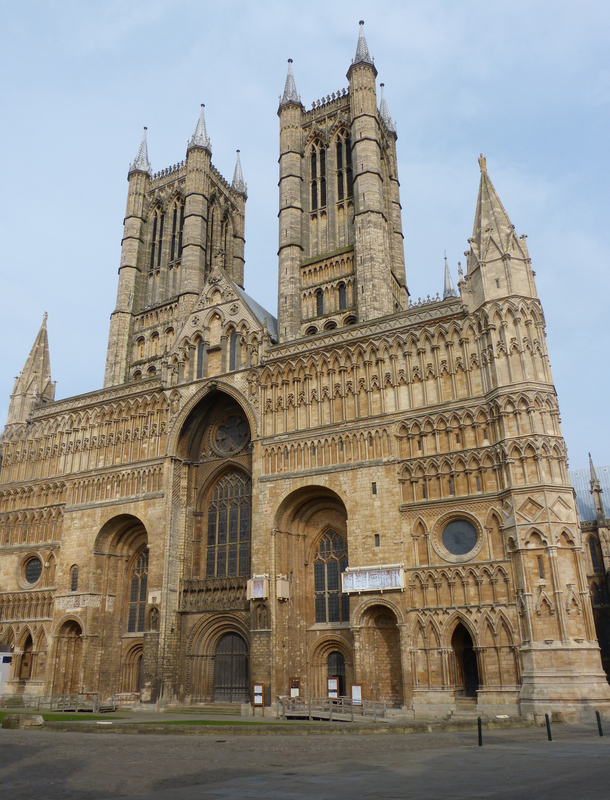 Lincoln Cathedral as it appeared through the ages can be seen here. 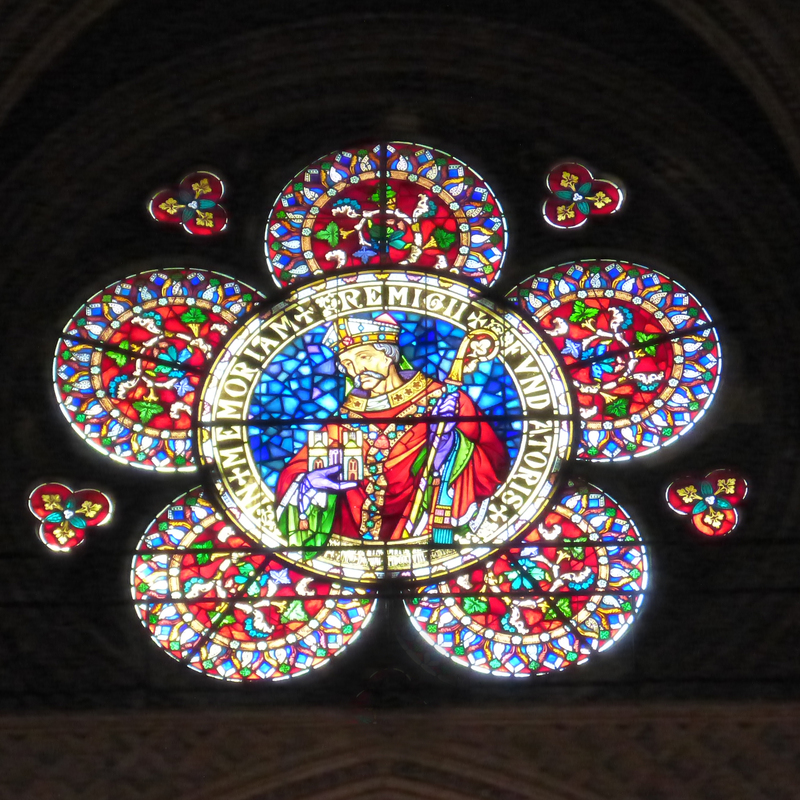 Wikipedia has compiled a list of all the cathedrals in England and Wales with histories and links. How gothic cathedrals were built.